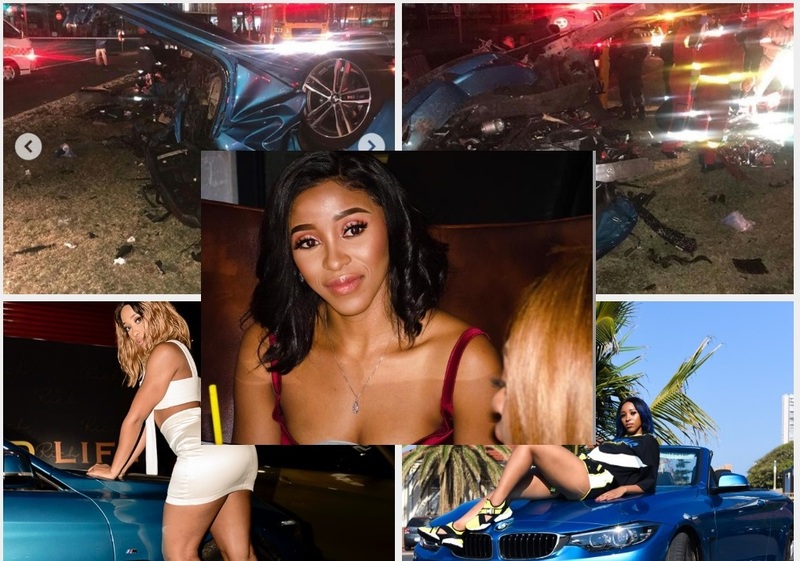 The 25-year-old Sbahle was involved in a horrific crash on Durban’s Margaret Mncadi Avenue (Victoria Embankment) on Thursday morning at about 4 am. Fitness bunnie Sbahle Mpisane is out of life support and is now breathing on her own without the assistance of hospital machinery, her businessman father Sbu Mpisane revealed on Saturday. A relieved Sbu Mpisane told IOL that the University of KwaZulu-Natal graduate remained in intensive care unit after the accident, where he revealed, she had suffered multiple fractures to her legs and arms. He said her head was not injured in the accident. “If you look at that accident picture, she should not have made it,” said Sbu Mpisane. He said he had been in and out of St Augustine’s Hospital since Thursday and was focusing his spiritual energy on his daughter. “She is out of life support now, she is breathing on her own, she is a fighter, she will be out soon,” said the relieved father. Sbu Mpisane said she had been to the theatre for an operation and was confident she would recover. Asked if he was tracking the support from social media, Sbu Mpisane said he was not on social media, but was receiving snippets of information and was aware of the furore over the Doves Funeral poster on Friday which saw the 135-year-old funeral parlour receive heavy criticism on Friday afternoon. “I am aware of the Doves issue, but my focus is on Sbahle. 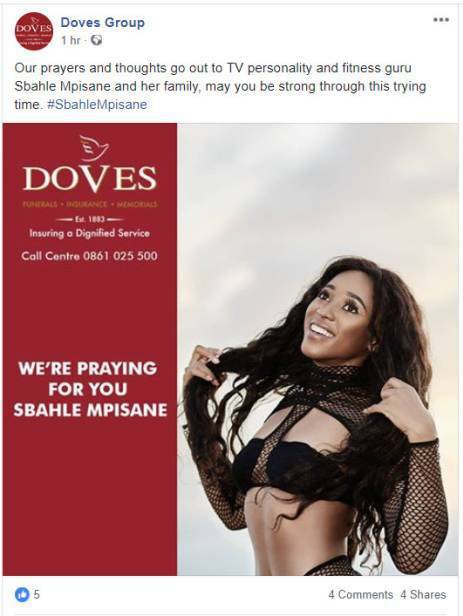 I have to focus all my spiritual energy on her so that she draws positive spirits from that, I cannot waste my energy on Doves, I am not bothered by what has been done by Doves at this stage in time,” Sbu Mpisane said. Dove’s chief executive Minki Rasenyalo speaking to IOL on Friday apologised for the furore over their social media posts and said they had been deleted because of the backlash that ensued. “We will never wish death upon anyone as a business,” she said. Rasenyalo said Doves had been running a social media campaign titled isiKhumbuzo since the beginning of the year. She said the campaign was about changing perceptions about the funeral parlour industry, celebrating life, promoting healthy living and appreciating people while they were alive. “We do not profit from death, we are more for life instead of death. We need to celebrate one another while we are alive, show the good memories we have with one another and celebrate the people that contribute positively in their lives,” she said.